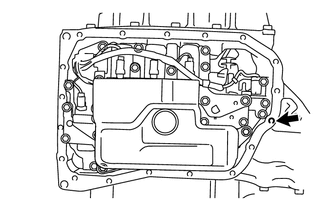 (a) Coat the manual valve with ATF and install it to the transmission valve body assembly. (a) Coat the O-ring of the transmission wire with ATF. (b) Insert the pin of the manual valve lever shaft sub-assembly into the groove on the end of the manual valve and install the transmission valve body assembly to the automatic transaxle assembly with the 11 bolts. When installing the transmission valve body assembly, be careful not to allow the speed sensor and automatic transaxle assembly to interfere with each other. Be sure to insert the pin of the manual valve lever shaft sub-assembly into the groove on the end of the manual valve. 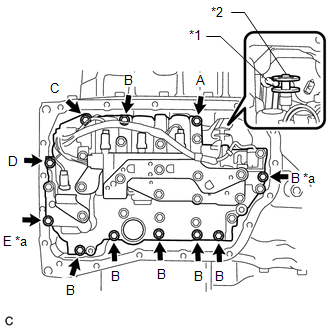 First, temporarily tighten the bolts marked (*a) in the illustration because they are positioning bolts. (a) Coat a new O-ring with ATF and install it to the valve body oil strainer assembly. Ensure that the O-ring is not twisted or pinched. 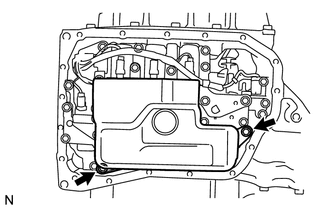 (b) Install the valve body oil strainer assembly to the transmission valve body assembly with the 2 bolts. 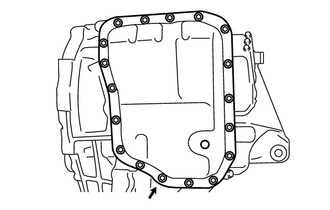 (a) Install the 2 transmission oil cleaner magnets to the automatic transaxle oil pan sub-assembly as shown in the illustration. 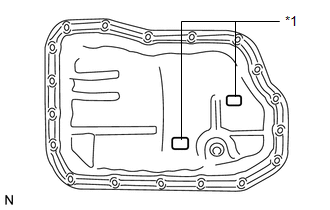 (a) Install a new automatic transaxle oil pan gasket to the automatic transaxle oil pan sub-assembly. (a) Clean and degrease the bolt and the bolt hole in the automatic transaxle assembly. 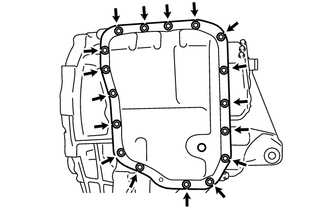 (b) Install the automatic transaxle oil pan sub-assembly with automatic transaxle oil pan gasket to the automatic transaxle assembly with the 17 bolts. Completely remove any oil or grease from the contact surfaces of the automatic transaxle assembly and automatic transaxle oil pan sub-assembly with automatic transaxle oil pan gasket before installation. (c) Apply adhesive to 2 or 3 threads on the end of the bolt. In order to ensure proper sealing of the bolt, apply adhesive to the bolt and install it within 10 minutes of adhesive application. If automatic transaxle assembly parts have been replaced, refer to Parts Replacement Compensation Table to determine if any additional operations are necessary (See page ).